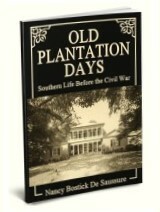 This reminiscence of daily life on a Southern plantation during the War Between the States is filled with vivid details of everything from methods of making dyes and preparing foods to race relations and the effects of the conflict. The author provides an unusual and beautifully-written primary source of Southern life inside the Yankee blockade, told from a point of view that is noticeably different from most post-war accounts. Click HERE to read the staff review of this title.